There have been a couple of guys who wanted to know how to read a compressor map. Hopefully, I haven't made any mistakes this time (unlike the last) and this will prove to be useful to you in your understanding of a compressor map. Reading a turbo map isn't as difficult as it looks. The map displays 4 key pieces of information. C. The pressure ratio of the air being pumped (that is, the ratio of pressure that it is capable of that pumping in contrast to the ambient pressure of the atmosphere surrounding it). D. The surge limit... the danger zone for a turbo whereas torsional pressures and heat can become nasty enough to bend turbine blades. Lets take a look at a typical map. We'll start with one of my all-time favorite turbos, the venerable GT3582r! Yummy!! Nice huh? Looking at the map, we can see that its capable of moving 60lbs per/ min as indicated by the "lbs/min" bar in the bottom of the map going from left to right. It takes 1lb/per min to produce 1hp min. So, we can say that this particular turbo is capable of pumping 600hp worth of air max. So far, we only know now that the turbo can move that amount of air. Now we need to figure out how we determine the pressure or "boost". The pressure ratio, as shown on the left side of the map, shows the boosted pressure. At sea level, the pressure is 14.7psi. If you're looking at a boost gauge, this amount of outside air-pressure will not be present on the gauge and will read zero psi. Its only when the pressure rises higher than 14.7 that you will see the boosted pressure. So we can define the "P.R." 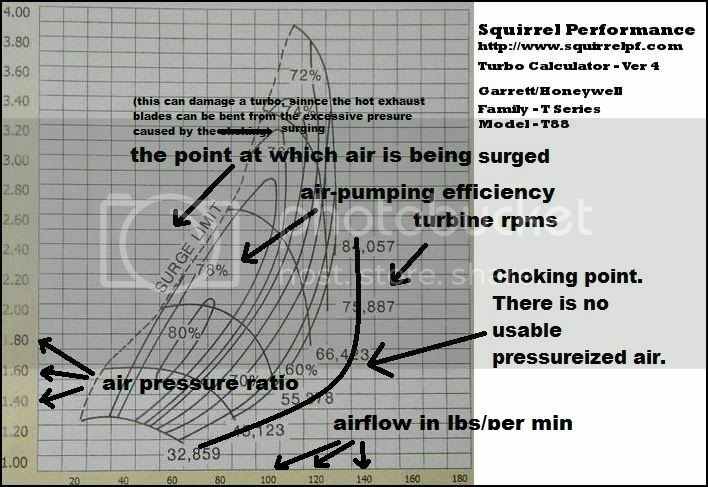 as a multiplying factor used to determine the amount of actual boosted pressure entering the engine. Now we know how to read both the pressure ratio and how to determine the amount of air that can be pumped. The next thing to determine is the efficiency of the compressor. You will notice these little islands that are displayed on the map. These islands represents the amount of efficiency that a particular amount of air can be pumped at a particular pressure. Lost efficiency= increased heat in the pressurized charged, which ultimately equals a drop in air density, less oxygen content and increased chance of detonation. Remember, the amount of boost, DOES NOT indicate the amount of air being pushed into the engine. (Pressure and air-volume have no direct relation to one another). 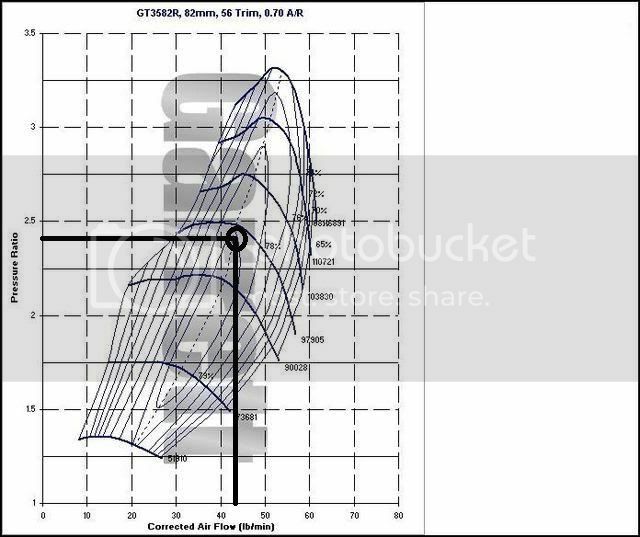 With that being said, here's a compressor map of a turbo that's being used on my roommate's project 5.3l Camaro. I've detailed some basic information. The far left of the compressor map has a zone marked as the surge limit. This marks the area where the turbo can get damaged. Air will build pressure and store energy like a spring which will begin to exert torsional forces against the shaft that can bend turbine blades if that torsional force becomes to great. This happens where the turbo is producing boost, but the engine cant consume the air. When that happens, the pressure builds until it starts being forced back through the housing. you can hear the fluttering sometimes as big-turbo drag cars are starting to stage. That fluttery sound that you hear from a turbo system right before the BOV opens is "surge". It may sound cool, but its NOT your friend. The choke zone is the area to the far right where the compressor isn't making enough making enough volume and is just wasting energy. (Its identified in the pic as the curved line I drew). The areas of crappy efficiency on the map are just as bad. Over spooling the turbo to try and get more boost past this point is pointless. 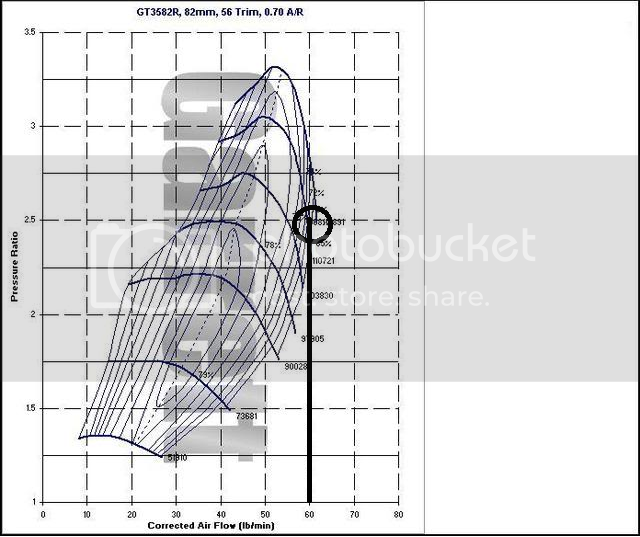 Its good to try and plot a boost curve that will stay well within a good efficiency range. The GT3582r turbocharger seems happy pumping 50 lbs of air at 3.0 p.r., so 500hp at 29 lbs of boost seems to be reasonable for this turbo. This T88 in the diagram is able to move nearly 110lbs of air at 3.0p.r. That equates to 1,100hp worth of air at 30lbs boost with room to keep going!!! So like I said... "boost" means nothing by itself. To sum it all up, the compressor maps allows you to scope the reasonable amount of air volume x pressure for your application. It seems that ALL the cruise control stalks you find at the JY nowadays are non-working. The Cruise switch doesn't work. Tired of paying $40 for a new stalk, I decided to dismantle and attempt repairs to what I had. The stalk is glued together and there will be some minor cosmetic damage during the dis-assembly, but if you file down the burs before gluing it back together it is not serious. This is the stalk I am going to repair. First, separate it at the joint. I was able to grip a pair of wire stripper pliers into the joint and force the stalk apart. Slide out the switch by feeding the cable into the shaft. Pictures of tear down and re-seal of Harrison V5 air conditioning compressor. These are very common on the 60°V6 engines. They are very costly as a re-manufactured unit. The parts to re-seal them are about $30. I did this write-up for another forum but figured it would have interest here. I started with this unit. I had it on my 1972 Chevy Nova until it started leaking around the housing o-rings. It still cooled fine, it would just lose freon over about a 2 month period. It will go on a 2.8 carburetor engine in an older a-body car. I will be changing the pulley to a vee-belt pulley. First, remove shaft nut and install compressor clutch hub puller. Remove clutch hub, making sure not to lose the key! Remove the snap ring that retains the pulley to the compressor. Install a puller, making sure the puller bolt ONLY presses on the neck of the compressor, NOT the shaft. The socket sits on the neck, protecting the shaft. The pulley off. I will be changing this out for a vee-belt pulley. Now use the puller on the clutch magnet. OFF with the clutch magnet! Nasty looking. Will need to clean this SPOTLESSLY clean before opening it. After a few minutes with the Purple Soap and pressure washer, it's all clean! Remove the external parts. Take out the compensating valve and the oil plug. Remove the bolts that hold the compressor together. With all of the different top-end swaps and bottom-end builds out there, I was talking to Ben at WOT-Tech about the Diamond pistons and how different setups would affect the compression ratios (CR) of the pistons he was offering. I wanted to pass this piston information on to the users so that they could then determine what their final CR would be with any setup. Due to marginal sales, WOT-Tech has decided to no longer list or stock specific CR pistons anymore. What does this mean to everyone? It means you can tailor the pistons to suit your specific application, no matter what components you are using.